Every summer Trader Joe’s parades out a new selection of beverages with the goal of quenching your thirst. Sometimes these are legitimately quenching, like Trader Joe’s Coconut Water, and sometimes they’re just picking your pocket book, like Trader Joe’s Maple Water. What it is: Green tea with a touch of mint. Worth it: Yes. Great tea at a good price. What makes something truly refreshing? I couldn’t tell you – but I can say that Trader Joe’s Moroccan Mint Tea definitely has *it*. A cool, quenching not-too-minty, subtly sweet green tea that is here just in time to beat back the summer heat. It might just be tea, but it’s tea done right. What’s so good about it? This green tea is infused with both spearmint and peppermint, then sweetened with a touch of cane sugar. Unlike most mint teas, which tend to be overpoweringly minty, or cloyingly sweet, TJ’s Moroccan Mint Tea gets it just right. Take a big swig of this, and the first thing you’ll taste is… tea. The actual kettle-brewed flavor of a cool green tea. Notice the deep mellowness of it – not too astringent, certainly not sweet – just right. Only as you begin to take a gulp does the minty back show itself, enhancing the flavor of the tea and cooling the palette without overwhelming the natural flavor of the brew. It’s a similar play with the cane sugar – just a hint has been added. Just enough to balance out the naturally bitter edge of tea, but not enough to make it a traditionally sweet drink. Trader Joe’s attributes this tea to Moroccan, but this sort of sweetened mint tea is common throughout the Mediterranean regions – or anywhere that the sun gets too damn hot. If that sounds like where you live, you’ll definitely want to consider picking up at bottle. Would I Recommend It: Yes – extremely refreshing! Would I Buy It Again: Most certainly. Final Synopsis: Perfectly balanced, wonderfully quenching tea. Before I get into talking about Trader Joe’s Dried Baby Bananas, I should probably acknowledge by absence lo, these last 4 months. After posting twice a week, every week for the last 4 years, I just got tired. That, combined with a new ad revenue sharing model implemented by WordPress (“Thanks for the increased traffic – we’d like to start paying you half as much.”) meant that a short Christmas hiatus turned into a long-term indefinite hiatus. What it is: Super tasty, tiny, dried bananas. Worth it: More than worth it. And honestly, that indefinite hiatus would probably still be going on if it wasn’t for two factors – first, Trader Joe’s started all but taunting me with some of the stuff they’ve been stocking, but more importantly, I received some very touching, very concerned e-mails from fans of the blog. I certainly wasn’t expecting that – and it simply melted my heart. Sure, I could get by without the blog, but how could I deny you, the reader, of my rambling, unprofessional, knee-jerk screeds? That’s what really kept me up at night. So anyway, I’m back. I’ll be making a couple tweaks in the weeks to come – in particular I’ll be posting only once a week going forward, and maybe making some changes to the format, but really when Trader Joe’s comes out with whole baby bananas, dried into tiny, chewy brown fingers, the time has come again to weigh in. These whole, dried bananas showed up a couple months ago, but I simply can’t get them off my mind. When it comes to dried fruit, I tend to think that there aren’t any real advances to be made in the field since, say, the Babylonians. It’s dried fruit – once they figured out you could dry fruit for storage it probably took them all of an afternoon to explore every available option. You wanna put apple slices in there? Sure, why not. Apricots? Orange slices? Mango? Pretty straight forward stuff. Maybe someone remembered to try persimmons a day or two later. This is low tech, elemental stuff. So why have I never before in my life seen whole dehydrated bananas? It’s certainly not because they’re not delicious, because these dehydrated baby bananas are the very definition of nature’s candy. Starting with whole baby bananas out of Thailand, Trader Joe’s simply dries them until they wrinkle up into desiccated, little brown fingerlings – a few inches long, and about half an inch wide. The sugar in the banana concentrates down as the bananas shrink, resulting in that mild, mellow banana sweetness and taste, only sweeter and stronger. Think jelly belly compared to jelly bean – more flavor in a smaller package. The resulting texture is still soft, but also vaguely leathery and chewy – making them extremely enjoyable to snack on. This, combined with the wrinkled, flaccid, tanned appearance is perhaps a bit off putting. I’ll admit that the notion that this must be a little bit what munching on a mummy’s fingers would be like did flash through my brain on more than one occasion while eating these – however they’re so tasty and snackable that they easily overcome any reservations about texture or appearance. Trader Joe’s suggests that these make an excellent snack for “little hands and large hands alike”, which only reinforces the whole “I’m eating fingers” thing, but still makes a good point. You may only get about 20 of these baby dried bananas per 6 oz. bag, but they satisfy so well, and are so cheap, that they should last a a whole carful of munchkins, or an office of inquisitive co-workers. Final Synopsis: Delicious, tiny, dried bananas – nature’s answer to the fun-sized candy bar. Would I Recommend Them: Absolutley. Would I Buy Them Again: I already have. Few things are more tempting and decadent than a thick and creamy dip – and the king of these is no doubt the Spinach Dip. There is no party or social gathering that can’t be improved by the addition of a good spinach dip. Rich, cool and savory, even a mediocre spinach dip can elevate a humble tortilla chip to heavenly levels. Worth it: Yes. Healthier, and still tasty. Of course, as is usual for anything that tastes so good, spinach dip is terrible for you. Loaded with lethal levels of fat, spinach dip is the sort of condiment designed to test your willpower to the utmost. Perhaps just a nibble, you think, maybe just a chip or two… We all know where this leads – into the grasping, inescapable current of a spinach dip whirlpool. 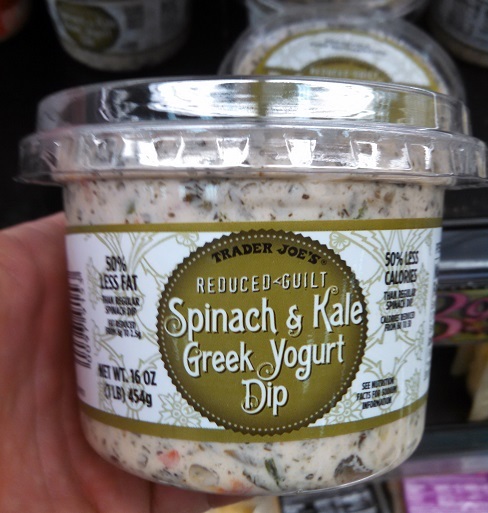 Fortunately, Trader Joe’s has come to the rescue with their new Trader Joe’s Reduced-Guilt Spinach & Kale Greek Yogurt Dip – another entry in their line of “reduced-guilt” dips. We took a look at their reduced guilt chunky guacamole and reduced guilt chicken salad before. Both delivered uneven results. As is so often the case for “diet” foods, it’s easy to make a low-fat, low-cal food product, it’s just hard to make it taste any good. “Reduced-guilt” products walk a dangerous line. You have to sacrifice flavor in order to be healthy, but stray too far to one side or the other and you end up with something pointless and stupid. Healthy, but too bad tasting, and no one will eat it. Good tasting, but not particularly healthy, and you might as well just get the full calorie version. In this case, Trader Joe’s manages to walk the tight-rope perfectly. This Spinach and Kale dip isn’t quite as delicious as the real thing, but it’s damn well close enough. A rich mixture of kale, spinach, water chestnuts, red peppers, carrots, green onions, garlic and even a little mayo create a colorful flavor pallete that makes a satisfying, full-bodied snack for crackers or chips. Whenever you sub out sour cream for plain greek yogurt, as TJ’s has done here, you’re going to lose a little zip. That’s still the case here. After a big bite of this dip, you’ll notice it’s missing a little something on the tail end – a touch bland where it should be a touch zingy. That’s just the unavoidable cost of keeping the fat content under control. Fortunately, the blend of other vegetables and seasonings pep the dip up, compensating for this flatness fairly well. And boy is that little bit of blandness worth it. Trader Joe’s normal spinach dip has 70 calories per serving, 60 of those from fat. This greek yogurt dip has less than half that per serving – 30 calories, 20 of those from fat. All in all, that’s a pretty good trade off. No every “reduced guilt” product is worth it, but this dip is an exception to the rule. Would I Recommend It: Yes, healthy and tasty! Would I Buy It Again: Sure – this is a winner. Final Synopsis: Low cal spinach dip worth the price. Oh my god – they did it. The bastards finally did it! Our week of decadence continues with Trader Joe’s Cookie Butter Cream Cheese. On Tuesday we had a look at Trader Joe’s overwhelming burrata and prosciutto flatbread. The excess of rich cheese and meat on that was literally too much of a good thing. It’s easy to image that a cookie butter infused cream cheese might stumble into the same pitfall. Luckily for us, that’s not the case, as this heavenly cream cheese balances its two decadent elements in harmony. What it is: Cookie butter flavored cream cheese. Worth it: Yes. Cookie butter is always worth it. 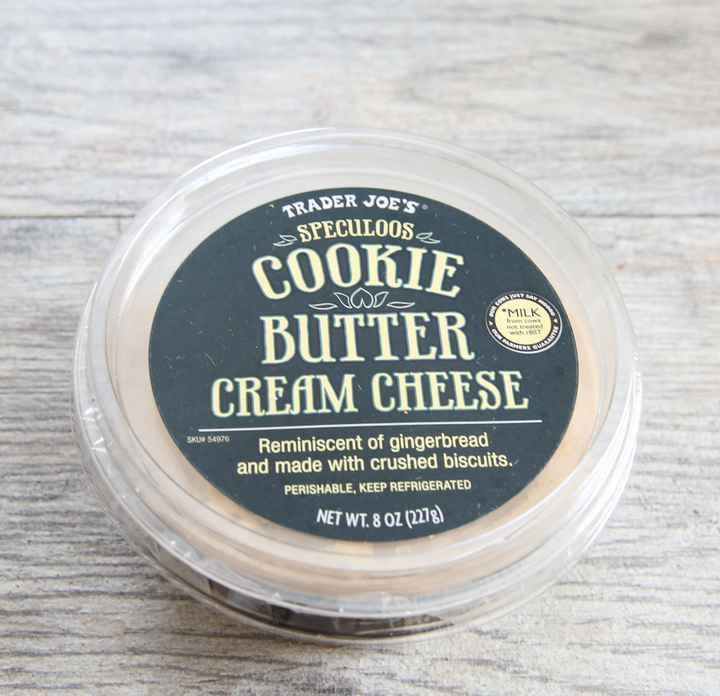 In hindsight, it’s only natural that Trader Joe’s would introduce a cookie butter flavored cream cheese. After all, they already have a Cookie Butter Cheesecake and Cookie Butter Cheesecake Bites. The next natural step is to just release cookie butter cheesecake directly to the populous so we can start mainstreaming it directly into our arteries. TJ’s takes a straight forward approach to creating this delicious stuff. Realizing there’s no need to reinvent the wheel here, Cookie Butter Cream Cheese only has four ingredients: cream cheese, speculoos cookie butter, crushed speculoos cookies, and brown sugar. The result tastes like a 50/50 (or maybe 60/40) mix of cream cheese and cookie butter. It start out with the mild, cool and creamy flavor of a smooth cream cheese, instilled with the flavor of warm and yummy and ever so delicious speculoos cookie butter. In terms of intensity, the flavor is similar to the gingerbread and pumpkin spice cream cheeses that show up in grocery stores around the holidays. Essentially, it tastes like a thicker, more mild version of everyone’s favorite cookie-based condiment. That may not make it a household necessity, strictly speaking, but it does give you yet another way to incorporate cookie butter into your diet. Sure, we already have the cookie butter cheese cakes, cookie butter spreads, cookie butter ice cream and cookie butter filled cookies, but now we have a way to eat it for breakfast too. The obvious applications are to serve it up on nice slice of toast, or golden-brown bagel, but there’s nothing to stop you from going wild and using it as a fruit dip, as the basis for amazing cream cheese frosting, or even making your own cookie butter cheese cake from scratch. As for me, I already fall pray to the siren song of cookie butter too often as it is – scooping illicit spoonfuls into my mouth when my willpower breaks down. This cookie butter cream cheese may not be quite as rich and tempting as the original version, but odds are I won’t be able to keep it in my fridge for long. Would I Recommend It: Yeah, you should definitely try this. Would I Buy It Again: Not if I want to loose any weight. Final Synopsis: Cream cheese with a mild cookie butter taste. The tastiest letters I’ve ever eaten. Trader Joe’s candy selection is just as interesting and varied as any of their other product selections. In the past we’ve looked at some of their intriguing chocolate offerings (some more successful than others), their honey mint patties, and even their mango gummies. However, out of all of the candies I’ve tried so far, Trader Joe’s new Ts & Js Sour Gummies have got to be my favorite. What it is: Sweet and sour gummy candy. Sometimes you want something salty, sometimes you want something sweet, and sometimes you just want to pucker and grimace on something that will scour your taste buds with a coarse blast of citric acid. Trader Joe’s Sour Gummies is their answer to that masochistic desire for sour candy, and a marked upgrade on the only other contender for that slice of market space, the classic Sour Patch Kid. What you get with these sour gummies is a 7 oz. 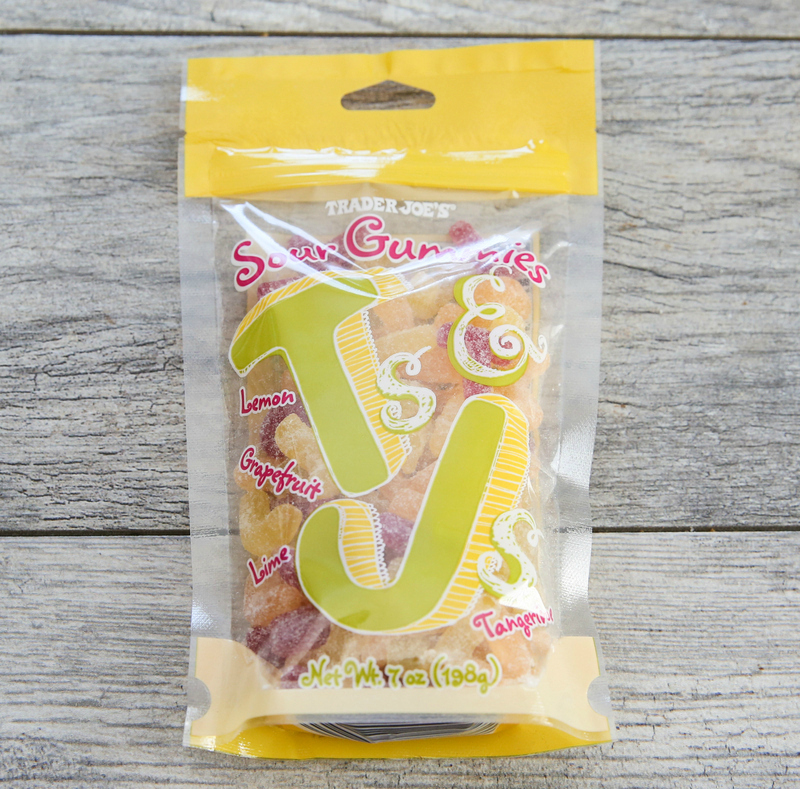 bag of little letters “T” and “J” in four citrus flavors, dusted by rough grains of cane sugar. Sweet at first, for just a moment, the sugar quickly gives way to a single so-tart-you-love-it punch to the kisser. Trader Joe’s isn’t pulling the punches either – these little candies are every bit as sour as Sour Patch Kids, and then some. After a handful you’ll be ready to put them aside and give your mouth a break for a minute. With four great flavors, you’ll actually enjoy the punishment. Unlike the vaguely differentiated “flavors” of Sour Patch Kids, Trader Joe’s actually delivers four distinct and interesting flavors – tangerine, Meyer lemon, key lime and grapefruit. Made with real fruit juice, you will be able to distinctly tell each little bite-sized letter apart by taste, if not by color. Best of the lot, in my opinion is grapefruit, which hits you with a kick of that unmistakably bitter grapefruit zest before giving way to the sweet gummy core. Even better, these candies are vegan, kosher and all natural – right down to being colored by natural vegetable extracts. At only a $1.99 for a bag, what are you waiting for. Drop those Sour Patch Kids off at the orphanage and pick up some of these instead. Would I Recommend It: Definitely, a great sweet and sour combo. Would I Buy It Again: Yup. Final Synopsis: Trader Joe’s Sour Patch Kids. Yowza, cookie butter is back – this time in bite-sized cheesecake form! Let out the angelic choir and ring the church bell until it cracks – happy days are here again! Or wait a minute. Am I being too hasty? After all, didn’t Trader Joe’s full-sized Speculoos Cookie Butter Cheesecake fall a little short of the mark? And isn’t it true that while Speculoos Cookie Butter is, by itself, the finest achievement humankind has ever produced, that most of Trader Joe’s cookie butter spin offs have suffered from the difficulty of living up to the bar set by their near-perfect progenitor? Yes, as we’ve seen time and time again, speculoos cookie butter, when mixed with other things, is almost never as good as cookie butter by itself. Yes, these cheesecake bites are delicious – delicate, decadent and the perfect size to indulge on without feeling guilty. However, while they succeed as cheesecake bites, they don’t actually taste like cookie butter. This probably isn’t the end of the world. Any cheesecake is better than no cheesecake, and certainly speculoos cheesecake bites are much better than no cheesecake bites at all. They only real problem I have is, if you’re going to sell me on cookie butter, I expect the cookie butter to be there. In this case, despite the mouthwatering nature of each pretty little bite, there just isn’t any cookie butter taste to speak of. 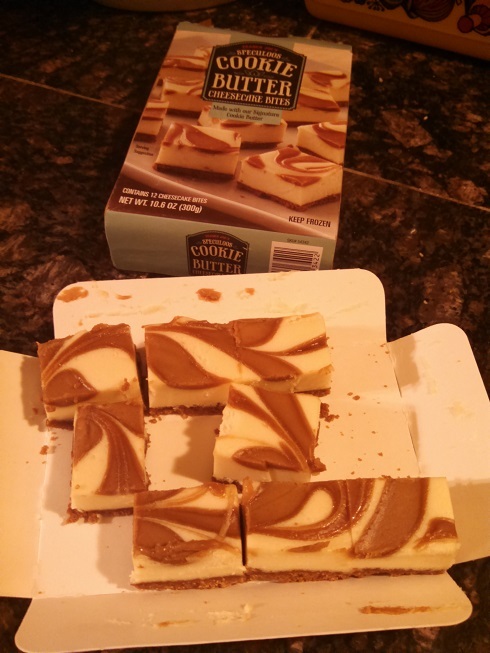 Even though the top of each bite is swirled with a little smear of cookie butter, that taste doesn’t come through. There’s some magic something in cookie butter that is lost as soon as you start blending it into other deserts, and in this case it’s lost almost completely. Compare these to the Trader Joe’s full-sized cookie butter cheesecake. That whole cake was layered with a thick schmear of delicious speculoos, and it still lost something in the execution. On the other hand, this is Trader Joe’s very first foray into making cheesecake bites, and as an experimental product, I love it! It’s a cold, hard fact that cheesecake is the best damn desert a person can hope for – and it’s an equally cold, hard fact that if you eat more than a slice and a half of cheesecake in one sitting your heart will clog up and explode. These cheesecake bites allow you to indulge in a bite-sized square (or three) of cheesecake, satisfying that craving without blowing out all your fitness goals. As a way to get people on board for bite-sized cheesecake squares, it makes sense to launch the product with that cookie butter name recognition. However, as a cookie butter product, they don’t really stand up to scrutiny. TJ, you should have more faith in your delicious cheesecake recipe – these are delicious by themselves, with or without cookie butter. Would I Recommend It: Yup, as long as you aren’t hankering for a cookie butter fix. Would I Buy Them Again: Yeah, the next time a cheesecake craving strikes. Final Synopsis: Great as little bites of cheesecake, not so great as a cookie butter delivery system. I…I don’t know where to begin on this one. It’s like someone just started free associating nouns and they decided to make it a product. Holy cow – what? 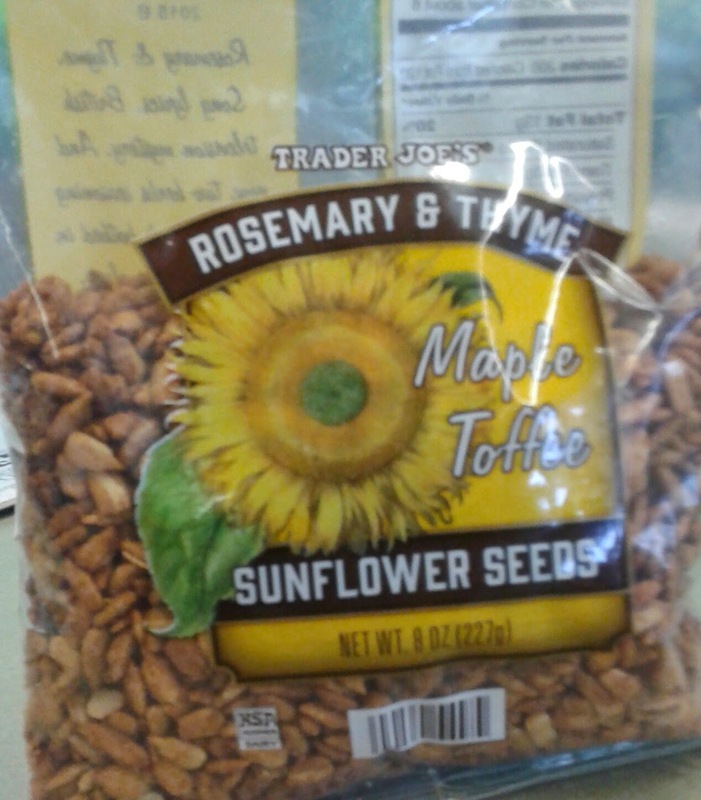 Trader Joe’s Rosemary and Thyme Maple Toffee Sunflower Seeds? Wait, Seriously? Look at that, just look at that – you can practically hear the desperation of the copy writer as he strains himself to sound casually breezy. The struggle as he tries to convey that this is just some toffee and rosemary and whatever, no big deal – while he knows perfectly well that he’s never once in his life even heard of anyone doing this to any food product, let alone sunflower seeds. I don’t know – maybe it’s me. Maybe I’m the one who’s gone crazy because I’ll tell you this much right now – these rosemary, thyme and toffee seeds are actually pretty good. Could a sane man dare utter that sentence? That very excellent question is beyond the scope of this blog post…all I can say right now is that Trader Joe’s is as skillful as they are brazenly daring. How else could you explain the delicately balanced mixture of spices, sugar and seeds that makes these snacks compulsively snackable? I don’t know about you, but when I think rosemary I’m thinking, like, Rosemary Chicken levels of rosemary. BAM!-in-your-face, yup-that’s-rosemary, levels of rosemary. Trader Joe’s has been very careful not to give us that sort of rosemary here. There’s a bit more rosemary than salt on these seeds, but not by much. It’s just a hint of rosemary, along with an even more subdued touch of thyme, that you’ll taste behind the sweet and warm taste of crispy toffee. If you think about these sunflower seeds as toffee-coated candied sunflower seeds, you’re on the right track. A handful of crunchy, sugary, maple toffee is what you’re going to mainly taste when you pop these in your mouth, followed by the familiar mildness of sunflower seeds, and only then will you notice the subtle but persistent touch of these two herbs, rosemary and thyme, which lingers long after the sweetness has faded. The seeds benefits from the light touch, and they’re easy to munch down, but in the end it’s still a strange taste that takes some getting used to. Why Trader Joe’s even bothered to put rosemary and thyme in this mix at all, I don’t know. It seems like the logical move would’ve been to do something like cinnamon and nutmeg, or just to keep the herbs out of it all together. As it stands, this makes for a weird snack. Sweet and savory tastes rarely mesh well – and while these sunflower seeds are pretty good, the tastes ultimately clash more than harmonize. Trader Joe’s has presented us with an intriguing new combination of flavors with these sunflower seeds, but it fails to make a persuasive case for its own existence. Would I Recommend It: I wouldn’t – while they’re not bad, they’re probably too idiosyncratic to really catch on. Would I Buy It Again: I really doubt it. They get points for daring though. Final Synopsis: Candied sunflower seeds with just enough rosemary and thyme to make them weird.